Move over pumpkin patch small world! Kids over here are knee deep in building a fabulous ghost patch. 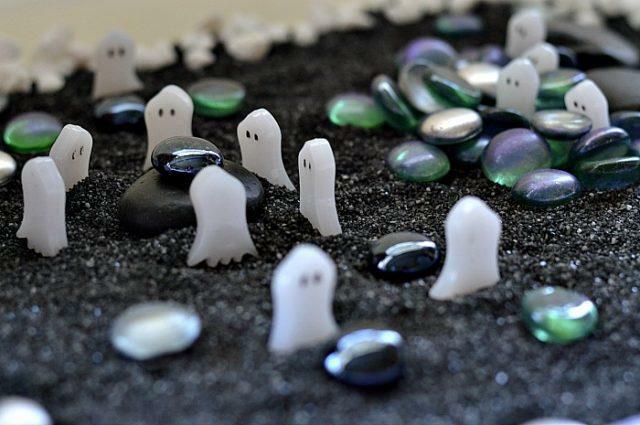 This Halloween sensory activity comes straight from the head of my 7 year old whose first instinct was to build a Halloween themed small world when I set out some new sensory materials for them to explore. 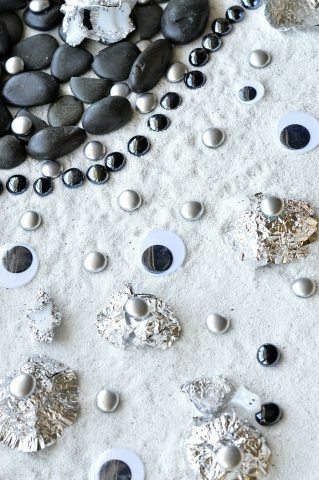 I always have this tradition of setting our materials and have them explore and the entire activity kind of transpires from that. I collected quite a few of our sensory materials we have purchased from multiple places and set them out. 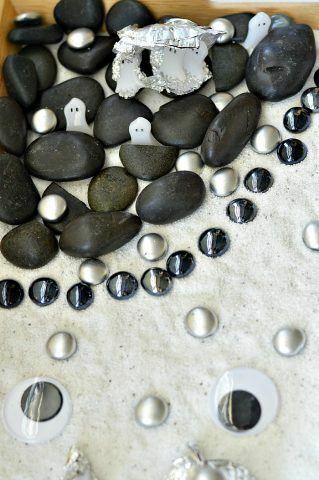 Here is a list of everything we have used in this Halloween sensory activity. I have also tried to find similar products online so you have a visual reference. 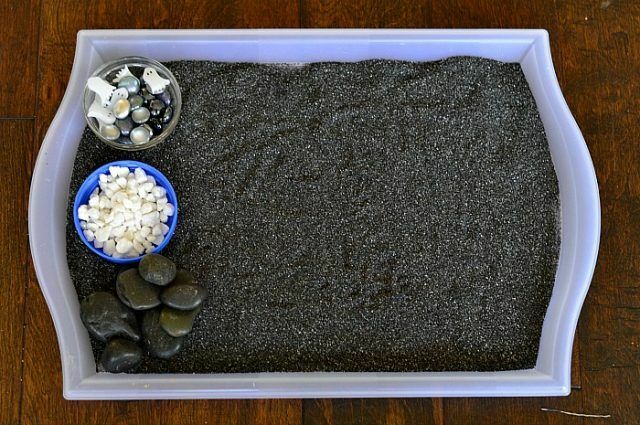 I separated the sensory items into different containers and set out a plastic clear tray with black craft sand and laid it out and invited the children to play, create and explore. 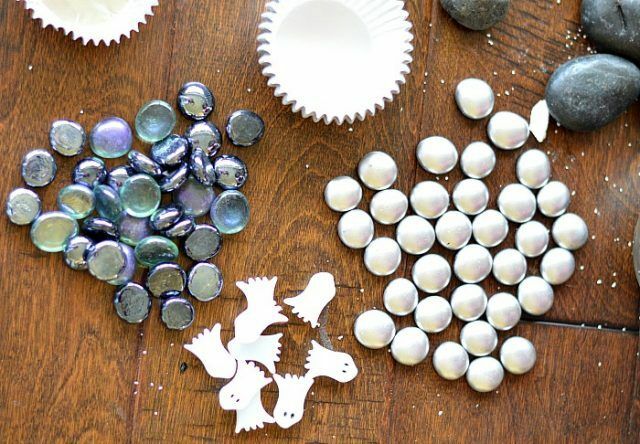 This Halloween sensory activity was pretty much free form with the kid exploring the materials, choosing and creating with the materials. Her favorite seemed to be the gems. 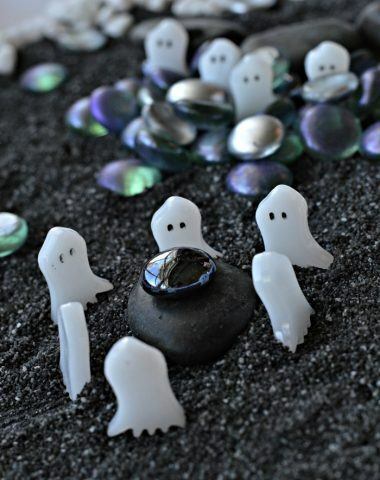 Actually I got the plastic mini ghosts and gems as a kit which was originally supposed to be a vase filler. 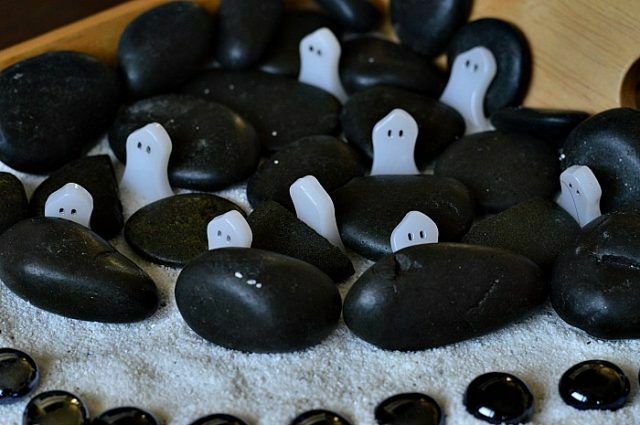 Here the ghosts are having a meeting around a rock. 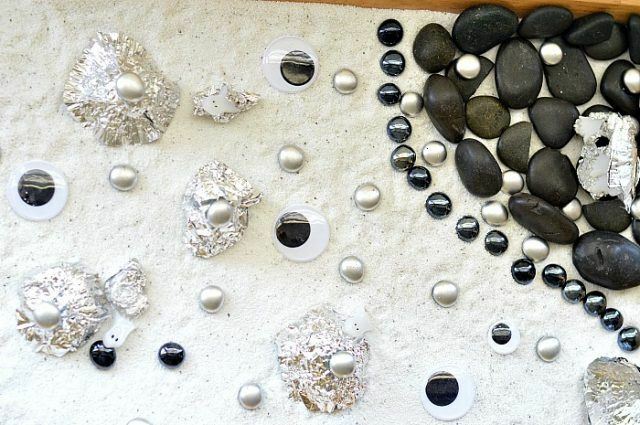 She started off with using all the smooth black rocks to create a barrier of sorts and named them a patch. “Except that it is not a pumpkin patch but a ghost patch where ghosts hide and play”. 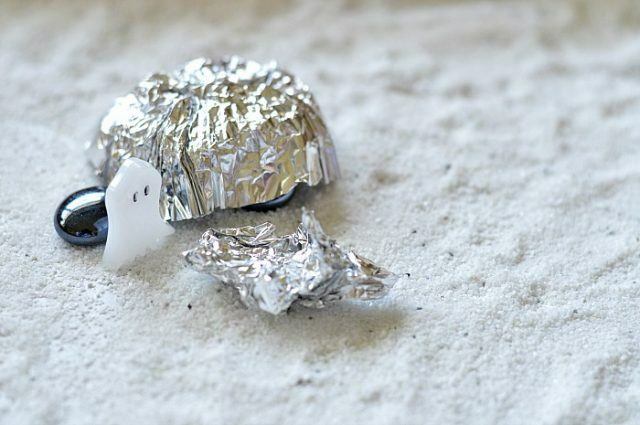 She ended up using a ton of foil to create jewelry, throne and crowns for the queen, king and princess ghosts! She was very involved in working on her small world. I loved that she worked in layers and kept coming back to the little world she created. Her work was very intentional and she even organized and separated her gems according to the colors. Love the use of Googly eyes for the spook factor. She also created foil thrones for all of her characters. 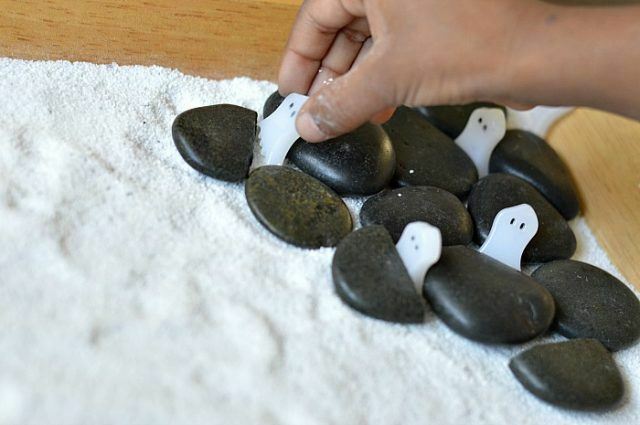 These sneaky little ghosties are hiding behind rocks and playing. 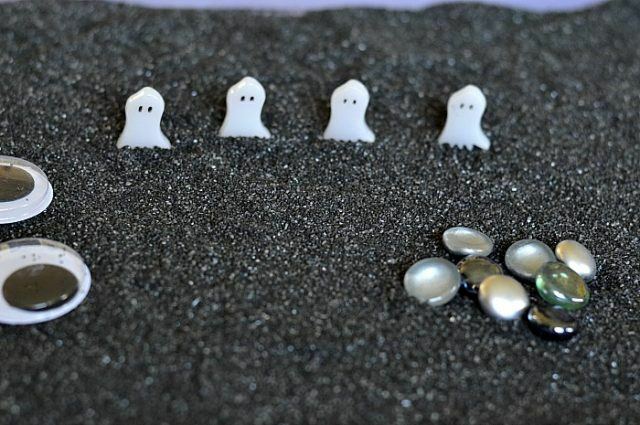 Oh by the way, they are not mean ghosts, they are just friends playing and not meant to scare people. 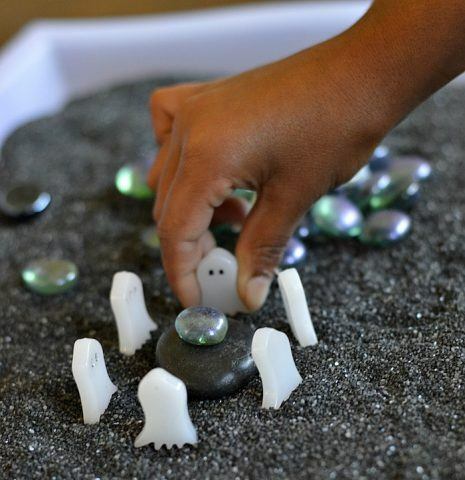 I loved that this entire Halloween activity was great for building fine motor skills. 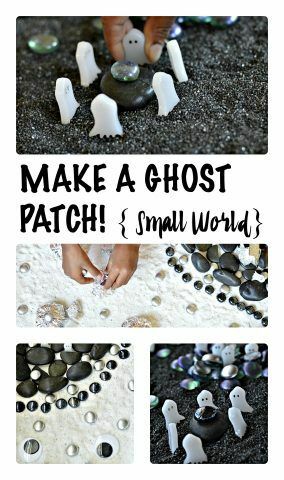 Her designs and patterns for her ghost patch were intricate and well thought out. We have another entire activity with the same materials that is completely dedicated to building fine motor skills.